Kindergarten, that time when little kids grow up. When they learn their letters and start to read. But there is one problem. Have you looked into programs for learning to read? I have! There are a lot! When I say a lot, I mean, you will get lost in trying to find out what you want to use to teach your child how to read. 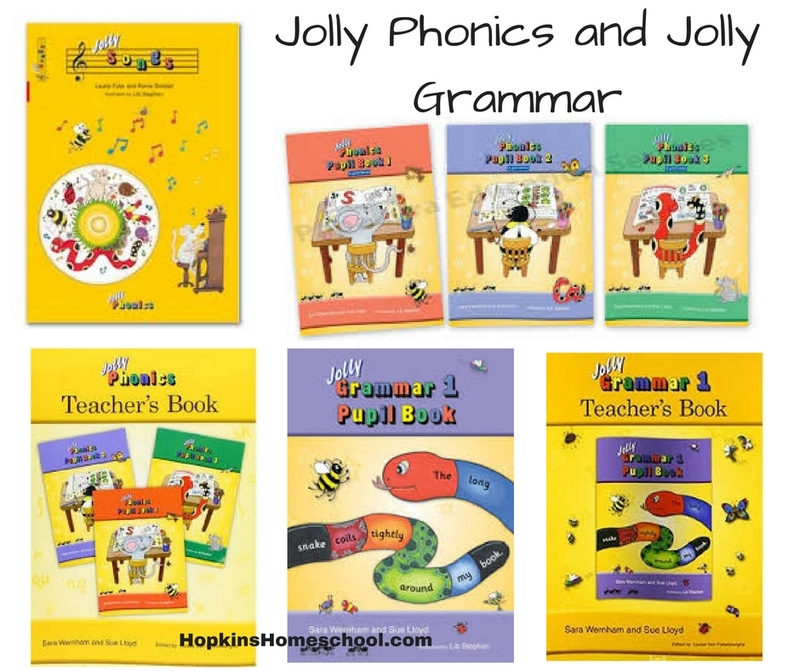 I have had the chance to try out Jolly Phonics and Jolly Grammar from just2ducks LLC at jollyliteracy.com. This program has been wonderful for Little Miss! Jolly Phonics is a phonics program that works with your child to teach them words as soon as possible. 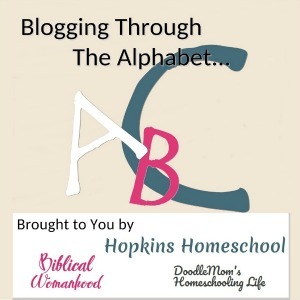 You will not be teaching your child the phonics in alphabetical order, rather in an order that allows them to form words right away with what they are learning. Jolly Phonics has a multi-sensory approach, so they can reach as many students as possible. Jolly Phonics teaches five skills to your child. 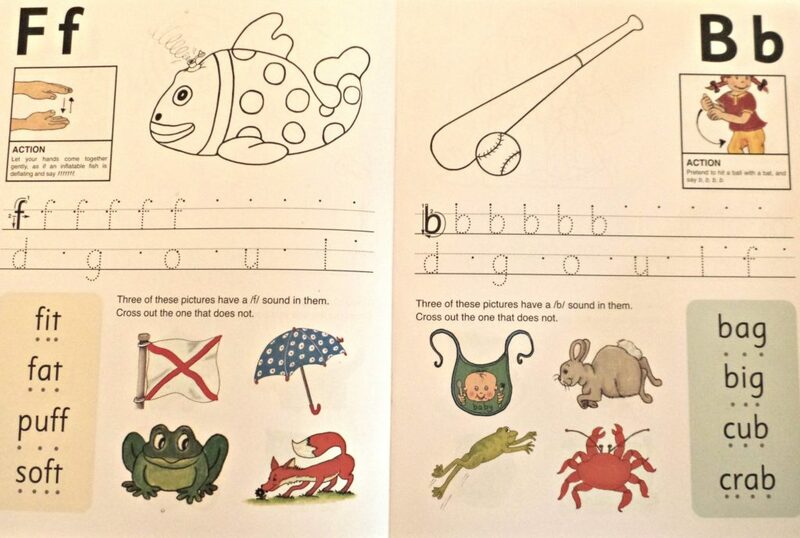 Learning the letter sounds: Children are taught the 42 main letter sounds. 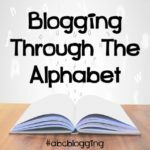 This includes alphabet sounds as well as digraphs such as sh, th, ai and ue. Learning letter formation: Using different multi-sensory methods, children learn how to form and write the letters. 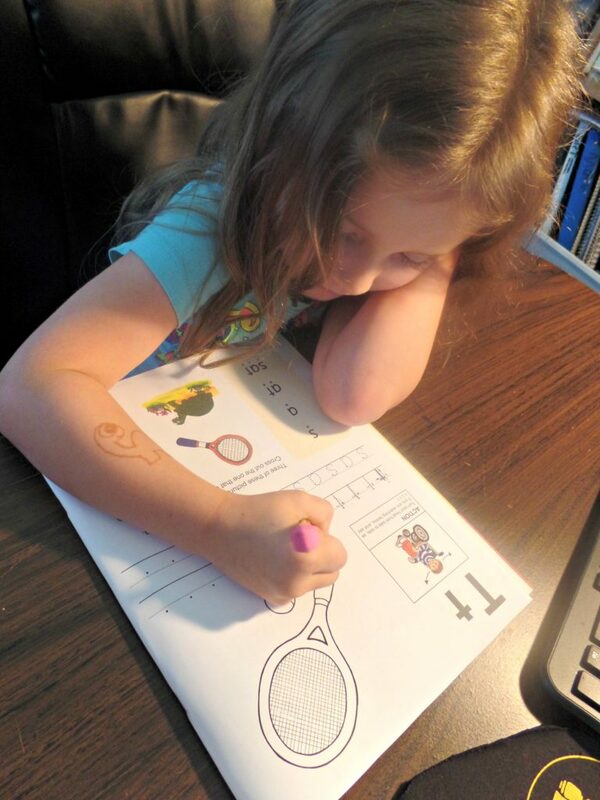 Blending: Children are taught how to blend the sounds together to read and write new words. Identifying the sounds in words (Segmenting): Listening for the sounds in words gives children the best start for improving spelling. 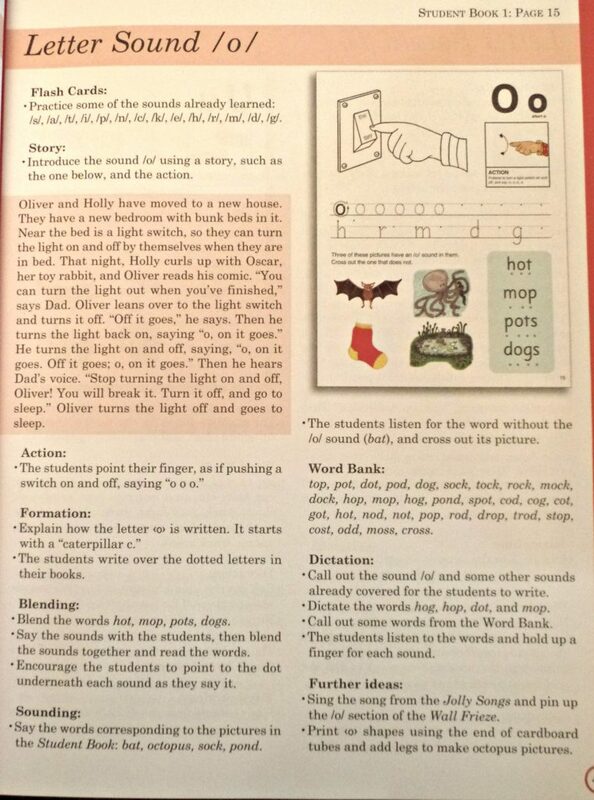 Tricky words: Tricky words have irregular spellings and children learn these separately. As with every program, mommy spent some time reading the beginning of the teacher's book before allowing Little Miss to work on this. I needed to know what I was going to be teaching and what tricks I would need to know. After reading through the explanations of the 5 skills, I got to the daily guidance section and was ready to get started. With Little Miss, we started on Book 1 of Jolly Phonics. 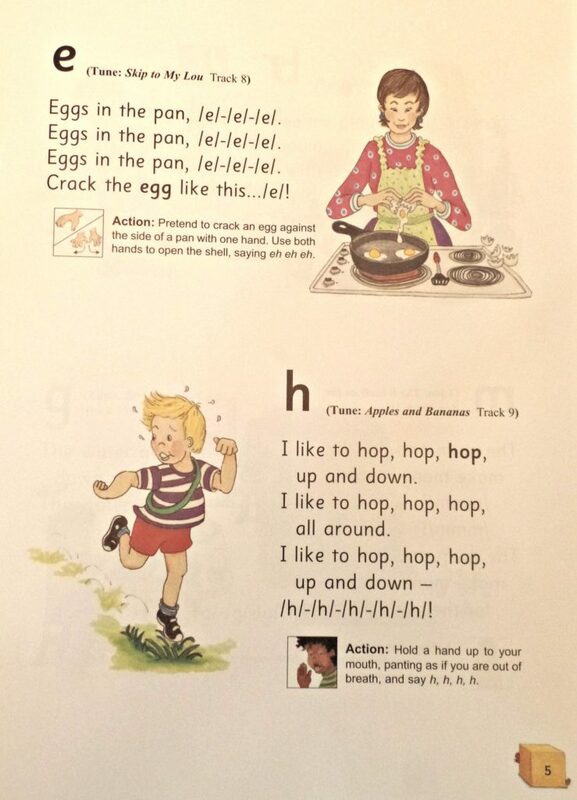 This books starts us off with the letter-sound group of "s, a, t, I, p, n". These letters/sounds are able to make numerous different words. This alone made Little Miss want to come back the next day. Once we tried the first day and found out how much fun we had, we decided to do one page a day. 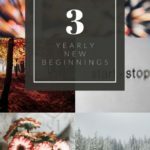 Every day we would start by practicing our previously learned sounds. After we practiced the sounds, we would move on to a story. This story would introduce us to the new letter/sound that we would be learning about that day. This story would use the sound over and over again. It was fun to hear the sound in a story and watch Little Miss picking it out. After we worked on the story, we would work on an action to help us remember the sounds. These actions also went along with the fun Jolly Songs. Little Miss would listen to this CD over and over again, even listening to the songs we had not gotten to yet, this made it easier when we were learning those letters later. We would move on to learning how to write the letter and even blending it with previously learned letters. We would finish up the day by doing the activity on the workbook page and coloring the picture. We have almost finished book one. We look forward to book two. This is where we take what we learn and actually work with the words instead of just the letters. Not only that, but we continue to work on practicing our writing of the letters. 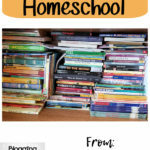 By the time your child has reached the third book, you are watching your child write and read. They will have built confidence in a fun and easy way. This has been such a fun program to use. It has a simple layout and moves easily from one day to the next. Little Miss enjoyed being able to learn to read right from the beginning. There was no waiting for a week or two. This program allowed her to start reading right away. This gave her excitement and confidence to keep on going. She loved listening the songs, and I love how these songs have such catchy tunes to them! The teacher's book is laid out wonderfully. I was able to understand it, and could use it without spending a lot of time studying it each morning. I knew that I would go to the day, go through the activities, and that was it. I didn't have all sorts of prep, yet Little Miss was having fun. We even had Baby Girl joining us from time to time with the songs that we were singing. Little Miss loved her workbooks. They were simple for her to understand, and she could do most of them on her own once she understood the new sound. This was fun for me to watch, but I had to keep an eye on her. Some days she wanted to keep working in the workbook without me, then we would have to redo the lesson so she could hear the sound! After using other programs for Ray Ray, and knowing that Little Miss was a different learner, I was happy to find Jolly Phonics for her. I can't wait until we make our way into the Jolly Grammar book and learn about parts of speech in the same fun way we have been learning the phonics. We were not the only family to try this program out. 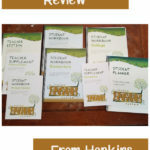 Head on over and see what the other families on the Review Team had to say about this program!